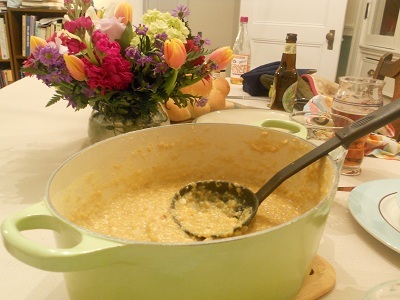 I spent most of March really wanting a hot bowl of broccoli and cheddar soup. I have no idea why it took me five weeks to realize I could make an entire pot of it in my own kitchen. But last week I did, and even shared a bowl or two with Rich and Lilli. I wasn’t going to mention it here, as I had made up my mind to share an asparagus recipe with you because it is finally, officially springtime, and hot creamy soup seemed so unseasonal. But then I noticed a post on Facebook from an old friend of mine, saying he was going to try and recreate Quizno’s broccoli and cheddar soup. He explained that he likes to make big pots of soups and stews and freeze them for when he and his wife both worked late. “Make some popovers or some fresh corn bread and I’m a hero.” Clearly the universe was sending me a message, and that message was to share this soup recipe with everyone so that we could all be weeknight heroes. So I made this soup a second time over the long holiday weekend, and froze it for the next time I want this soup, whether or not it’s in season. A few things worth mentioning: I totally Sandra Lee’d this one. Rich tells me to not be so hard on myself and that Sandra Lee would have doctored a can of stuff from the pantry, but I definitely cut a bunch of corners on this one. And you know what? I’d do it again. 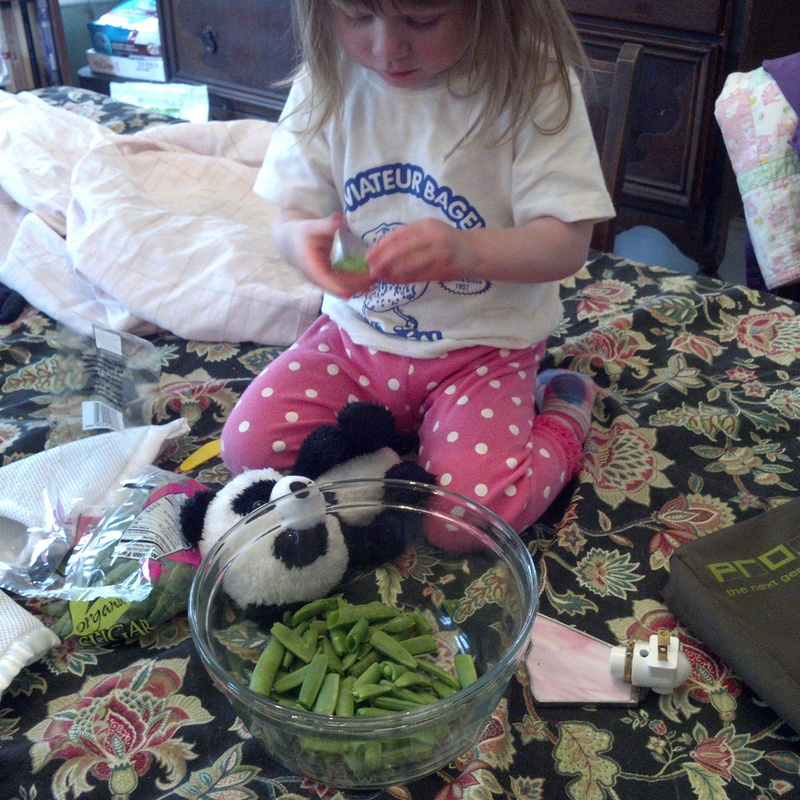 For instance, instead of buying a head of broccoli, I chopped up a bag of broccoli florets. I used a bag of shredded cheddar cheese instead of standing at the counter and grating a block of it. And I used a box of organic vegetable stock I keep in the pantry. The recipe is from Soup: A Kosher Collection by Pam Reiss, a cookbook I know I snatched off a pile of books to review from when I worked at a Jewish paper over a decade ago. Every recipe I’ve tried has been great, and the author not only categorizes the recipes by dairy, meat, parve, and Passover appropriate, but also says whether each recipe is good to freeze or not. So there you have it. A great soup that comes together in less than a half an hour. Have it for dinner tonight. Or have it for lunch next month. The choice is yours. Over medium-low heat, sweat the onion in olive oil for 5-8 minutes. Wilt the onion, but don’t brown it. If you are using broccoli stems as well as florets, peel them with a vegetable peeler or paring knife to remove the tough, fibrous skin from the tender flesh, then chop them up. Add the broccoli, salt, pepper and stock to the soup pot, cover and bring to a boil over high heat. Turn the heat down so that the soup simmers on low and cook approximately 10 minutes. The broccoli should be tender but not overcooked. In a separate bowl, whisk together the half-and-half (or heavy cream) and flour. Whisk this mixture into the soup and allow to simmer another 2-3 minutes, until the soup thickens. Stir in the cheese until it is well incorporated and serve. 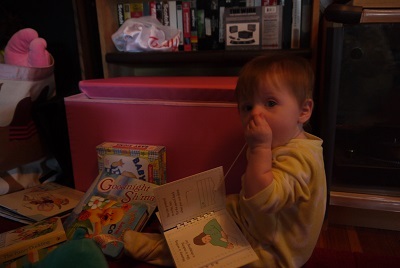 Lately, Lilli has been crawling over to her book chest – a soft cloth toy chest that I filled with books instead of toys – pulling herself up, pushing the cover aside, and taking out book after book. Sometimes we read the books, sometimes she eats them. It’s a mix, really. Watching her with her books reminds me of the books I used to love to read when I was a little girl. One in particular I was reminded of lately, and it’s because of a recipe. Kevin’s Grandma, by Barbara Williams, sounds like a pretty cool lady. She’s been a performer in the circus – riding a unicycle on a tightrope, no less. She knows judo, and goes sky diving. She is also quite the chef, because, according to Kevin, she makes a mean peanut butter soup. But Kevin’s friend, the narrator, has a hard time believing Kevin, and doubts about the peanut butter soup most of all. This summer I was sent The Leafy Greens Cookbook by Kathryn Anible. It’s not a vegetarian cookbook, so I haven’t checked out every recipe. Kale, chard, spinach, bok choy, and collards are some of the greens with recipes in here. I tested the Dijon mustard greens salad with capers and eggs on Rich this summer and he really enjoyed it. (I’m not a mustard person, so it was all him, and he licked the plate clean.) But it was the African Peanut Stew that caught my eye. Just like Kevin’s grandma, I thought. This week, when both a bunch of kale and a bag of sweet potatoes came in the CSA I thought of the recipe immediately. Turns out I had everything else already in the house, including the fresh ginger I keep in the freezer. The only slight change is that I had a hot red pepper and not a habanero chile pepper in the fridge. Like all recipes, use your best judgment with how spicy you want your dish to be. Anible suggests serving this over rice or another grain; I cooked up a cup of barley in the pressure cooker in 20 minutes while I was cooking this on another burner. I’m not going to use the times of how long each step took, because, like with most recipes, it’s a lie. I’ve never met an onion that becomes soft and translucent in 3 minutes, and sweet potatoes and carrots take more than 10 minutes of simmering to soften, but you’ll get the idea. Rich and I each had a serving the night it was made, and I had enough for 3 more Tupperware containers for lunches for the rest of the week. Of course, just like with the apple cake, I failed at taking a photo of the stew. It was very good, though. That’s the truth. In a 6-quart stockpot over medium heat, warm the oil until it shimmers. Cook the onion until translucent. Add the garlic, ginger and chile pepper, cooking for another 30 seconds. Add the broth or water, tomatoes, carrot, sweet potato, and peanut butter. Cover, reduce the heat to medium-low, and allow to simmer for at least 15 minutes, until the sweet potato is tender. Stir in the coriander, cayenne, spinach or kale, and cilantro. Simmer for an additional 3 minutes, until the spinach or kale is wilted, then season with salt and pepper to taste. Serve hot over rice or another grain. Top each serving with chopped peanuts. This stew can be cooled, covered, and stored in the refrigerator for up to 5 days. There are some dishes I can just count on. I know that Aunt Bev will be serving Brussels sprouts with leeks at her Thanksgiving in a few weeks. I know my mother-in-law will be rolling out chocolate peanut butter balls for the annual Carroll Christmas party. And I know that my mother will be serving red lentil stew this Shabbat. Let me explain this last one, because, well, it needs a little explaining: The Torah is divided into 54 portions, and every week, in synagogues around the world, we read the weekly portion, or parsha. Right now we’re in the Book of Genesis, and this week’s parsha, Toldot, tells the story of the twins Jacob and Esau. 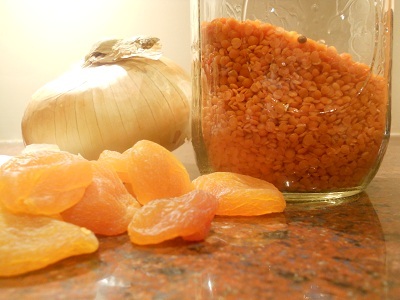 More specifically, we’ll be reading about the sneaky trade Jacob made with his brother, Esau the Hunter: a bowl of red lentil stew for Esau’s birthright. It’s a really great story, in a really terrific book of Torah, so my mom always serves a red lentil stew in honor of the portion. I’ve been meaning to post a red lentil stew for this week for three years running, and to make sure it would happen in time for you to cook it for Shabbat this year, I actually took photos of this dish when I made it last winter, when Rich’s friend Brian came for Shabbat dinner. The soup was great, and aren’t those flowers that Brian brought me amazing? This soup is a Mollie Katzen recipe, so you know it’s a good one. Although the dried fruit might sound a little odd, it’s really wonderful. Place the lentils and water in a soup pot or Dutch oven and bring to a boil. Cover, lower heat to a simmer, and cook for about 15 minutes. Add the onion, cumin, and mustard, and continue to simmer, covered, until the lentils are very soft (about 15 more minutes). Add small amounts of additional water, if it seems too thick. Add the garlic, apricots, and salt, cover, and let sit for another 15 minutes or so. Stir in the vinegar, black pepper, and cayenne to taste (and correct the salt too, if necessary). At this point the soup will keep for several days. Heat gently just before serving, and serve hot, topped with a few slivers of dried apricot, a drizzle of yogurt, and a sprig of cilantro or parsley, if desired. Forget Joyce’s Ulysses. More often than not, I find myself wishing for annotations on recipes I read. The offenders can be found everywhere: in cookbooks, online, in magazines…other blogs. I can’t be the only one who reads food preparation instructions with a raised eyebrow. Caramelize an onion in 15 minutes? I beg to differ. As thrilled as I was to find a hot and sour soup recipe in a recent issue of the magazine Saveur, I was skeptical about the time it took, not to mention a seemingly out of nowhere addition of pork tenderloin. I’m a huge fan of this fiery soup and was excited to try out the recipe — with reservations. 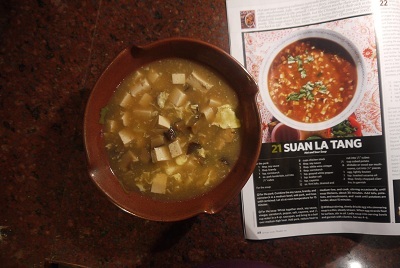 And now, ladies and gentleman, I bring you Suan La Tang, Hot and Sour Soup, with my annotations in italics. 6 shiitake or wood ear mushrooms, cut into 1/4 “ pieces. Whisk together stock, soy sauce, vinegar, cornstarch, pepper, salt, cayenne and ¼ cup water in a 4-qt. saucepan, and bring to a boil over medium-high heat. Add pork, reduce heat to medium-low, and cook, stirring occasionally, until soup thickens, about 30 minutes. Add tofu, potatoes, and mushrooms, and cook until potatoes are tender, about 15 minutes. Without stirring, slowly drizzle egg into simmering soup in a thin, steady stream. When egg strands float to surface, stir in the oil. Ladle soup into serving bowls and garnish with cilantro. Serves 4-6. The verdict: This soup was excellent and worth sharing. With annotations. I started it at 5:30 and it was a little after 7 before we sat down to eat. Will definitely make it again, but will keep in mind for the next time that this soup takes about an hour and a half to prepare. All this desserting led Rich to observe that I have fully become a Parr, since his family is much more about sweet than savory. This tendency starts with the matriarch, Nana Parr, who is a baker extraordinaire. When I first met Rich, he was excited to introduce me to Nana’s sugar cookies. They’re actually butter cookies, but they get their name from the sprinkling of sugar on top. They’re almost impossibly thin and crisp, not unlike a sugary Pringle. And yes, it’s impossible to eat just one. As Rich put it, they’re like crack. Over the past seven years, I’ve probably munched on hundreds of Nana Parr sugar cookies. Last fall, at my request, Nana brought me into her kitchen sanctum and showed me how to make them. 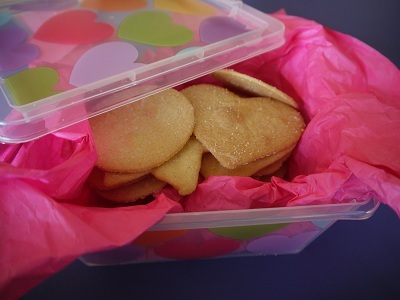 And for Mother’s Day, I tried as best I could to recreate her cookies as a present for her. I still need a little kitchen help from Rich. Nana introduced me to a pastry cloth, which I’d never seen before. 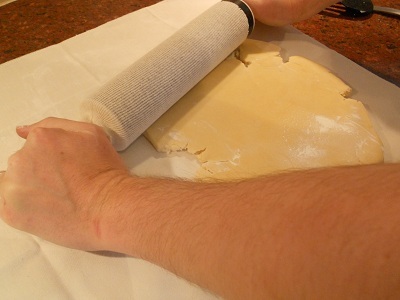 It’s a thin, almost gauzy cloth that she layers between the dough and the rolling pin, and it’s what aids her in getting the dough almost paper-thin. Nana also tells me the cloth is ideal for rolling out pie dough. You can buy pastry cloth, which comes with a matching sock for the rolling pin (think Red Hot Chili Peppers), online at Williams Sonoma. I struck out buying it at the actual store, so I found mine at KitchenWares on Newbury Street for $6. Nana also had a special sugar shaker, akin to a Parmesan shaker at a House of Pizza — I told you, sweet tooth — but we used a sieve for the same effect. Some of my cookies weren’t as thin as hers, and I have to admit that they do taste better thinner. Although the recipe card I have from Nana calls for baking the cookie sheets for six minutes, then a turn in the oven for another six minutes, the cookies are a much darker brown than hers. Hers actually don’t brown at all, and stay the lightest of yellows. I think the tan ones actually have a bit more body to them, but I have to be clear that that isn’t a genuine Nana Parr cookie. Using an electric stand mixer, cream the butter and confectioner’s sugar. When ready to bake, preheat oven to 375F. Sprinkle about a 1/3 cup of flour on the pastry cloth. Roll out the dough quite thin. Cut into shapes. Using a spatula, lay cookies on ungreased cookie sheets. 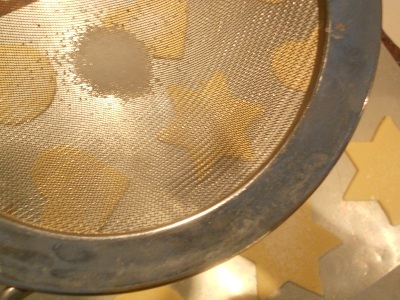 Sprinkle granulated sugar on top of the cookies. Bake for 6 minutes (or 4 or 5, depending on your cookie preference and oven), turn the sheets 180 degrees, and bake for another 6 minutes. Remove the cookies from the sheets and set them on cooling racks. Store in an air-tight container. I have learned from Nana that these cookies stay fresh in the refrigerator and freeze well. Well, gosh. First and foremost, thank you so much for all your kind comments last week, on the blog, in person and over e-mail. You really know how to make a lady feel loved. Second, sorry for not coming back sooner to share good food. See, remember how I complained about my back? It turns out it wasn’t a pulled muscle, but a tear in the cartilage in my lower back. To answer the two questions you are now asking: Yes, it does hurt; quite a bit, and yes, they gave me some excellent pain killers. I’m also going to an acupuncturist twice a week and am being treated with Chinese herbal medicine. I’m seeing the surgeon on Thursday. Anyhow, I stayed home from work for a better portion of the week with a heating pad pressed against my back. It hurts to sit for too long, so then I stand for a little bit, until that hurts… you get the picture. All this back pain has kept me out of the kitchen. This afternoon I stood by the counter and prepped some roots for roasting, and about 5 minutes in I had to call it quits and Rich kindly took over the project. So the recipe I have for today has been vetted by me, but has been prepared by my sous chef Rich. (I know, I tell people all the time I won the husband lottery.) This morning I woke up to the scent of household cleaning supplies as he had spent the morning cleaning the kitchen, the bathrooms, and was onto his second load of laundry. It had been very cold last week, and this recipe would have been perfect if I had made it then. Of course, we are now experiencing the “January thaw” Old-Time New England Cookbook talks about, although there’s been nary a snowflake to melt. Now, about this recipe: It’s a mushroom barley soup from Mollie Katzen’s Moosewood Cookbook, which I feel is one of those desert-island cookbooks. The first time I used this recipe was in my early twenties, when a guy I had a crush on off-handedly mentioned he loved mushroom barley soup. I “coincidentally” showed up the next day with a gallon Ziploc bag full of it. Good stuff. 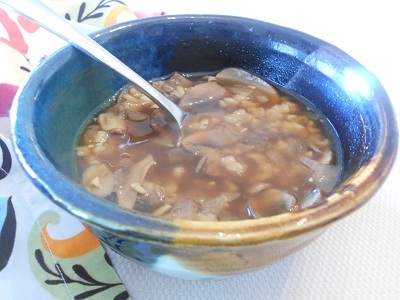 When most people think of mushroom barley soup, they think of something thick and porridge-like. This is more of a broth with chewy bites of barley and mushrooms. 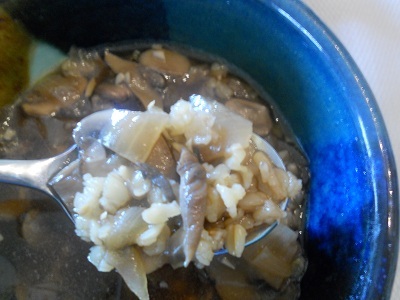 I’ve altered the recipe a little bit for the reflux: removing the sherry, and changing the soy sauce to tamari to create a second layer of umami, as both the mushrooms and the tamari are chockfull of it. The result is almost meaty, even though the dish is completely vegetarian. (It could also be made vegan by substituting oil for butter.) The mushrooms used here are white button; nothing fancy. The onions are slowly sautéed in a separate pan until they are translucent and have lost their bite, as was done to the garlic. I’ve also eliminated the fresh black pepper Katzen calls for. If someone at your table finds it lacking, just make sure the grinder is nearby. But honestly, this soup doesn’t need it. With a slice of leftover challah, this made a very nice lunch. I used a small, handmade bowl, which was about 1/3 smaller than a regular soup bowl. You have to be careful not to eat large portions with the reflux; an overstuffed stomach can cause a lot of discomfort. 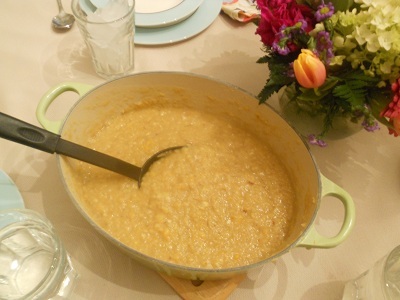 Place the barley and 1 ½ cups of the water in a large saucepan, or a Dutch oven. Bring to a boil, over, and simmer until the barley is tender. (20 to 30 minutes). Meanwhile, melt the butter in a skillet. Add the onions and sauté them until they are completely translucent but not browned. Add garlic, mushrooms, and ½ tsp. salt. Cover and cook, stirring occasionally, until everything is very tender. About 10 to 12 minutes. Stir in tamari. Add the sauté with all its liquid to the cooked barley, along with the remaining 5 cups of water. Simmer, partially covered, another 20 minutes over very low heat. Taste to correct seasonings, and serve. *I realize that the packages of button mushrooms are 10 ounces, so if you’re using one of those, reduce the water by a cup, and the tamari by 1 Tbs.